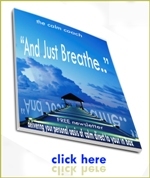 Your Breathing Space – your one-stop shop for everything you need to move to a calm and more ordered life. In this section I will take you through four key areas of life that will enable you to live harmoniously and allow you to be in perfect tune with your mind, body, spirit and emotions. Time is something we neither stop nor turn back. It is the ultimate dynamic force that is always moving forward and in order to make the best use of the time that we have here on earth to maximum benefit then it is a good idea to work with it rather than against it.